Which instrument reduce the rate of deaths and complications in surgery by more than one third ? 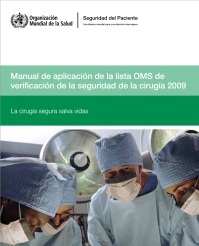 In January 2007 the World Health Organization (WHO) launched a project aimed at improving the safety of operative surgery worldwide. That initiative, named “The Safe Surgery Saves Lives”, pursued to identify minimal standards of universal applicability. Through a two-year international process, in consultation with patients, surgeons, anesthesiologists, nurses, and experts in patients’ safety, WHO produced a Surgical Safety Checklist (SC). SC consists of a simple set of items to be verified for safer surgical practice in any environment. At surgery, to follow appropriately the SC requires only a few minutes. SC is verified at three well defined times throughout the operation (i.e. before induction of anesthesia, before skin incision and finally, before the patient leaves the operating room (OR). For validation, SC was used in several hospitals around the world demonstrating that its use reduces death and complications in one third. Now, the SC is being gradually introduced in Spanish hospitals. However, efforts to show the benefits of the proper SC utilization are still needed. In Spain, SC use and acceptance are still low. E-UCM Research Group, in collaboration with the Department of Surgery at the Complutense University of Madrid Medical School, the Patient Safety Unit of the Doce de Octubre Hospital and the Laboratory of Computer Science of the Massachusetts General Hospital, has developed a game-like software simulation (aka serious game) to improve SC application. The aims of this tool are to teach how to appropriately use SC, to improve awareness of SC benefits and to show the consequences of not applying it. For the development of this videogame, health professionals have been involved from the early stages of the design. In addition, we have followed an agile development methodology based on four different stages: i) analysis, which main outcome is a formal document where the procedure to be represented in the game is described; ii) game design, where the game elements and game mechanics are described; iii) implementation, where different mock-ups of the game are produced; and finally iv) quality assessment, where experts check that the previously generated mocks-up represent the ideas gathered in the initial documents. To follow this approach, we use eAdventure platform which allows rapid prototyping, producing consistent results with a low cost. This approach is driven by the formalization of clinical procedure in a written document (in this case, the SC developed by WHO completed with the experience of the involved experts). The game starts with an OR role selection (the player can choose to be the responsible nurse, surgeon or anesthesiologist) and explaining to the player that he/she will be the coordinator of the SG. The game is based on two representative cases selected by the experts: a 20 year old male, athletic, with possible allergy to iodine; and an 87 year old woman, obese, diabetic and hypertensive that will be operated for a multi recurrent voluminous incisional hernia that causes crisis of partial bowel obstruction. For each case, the user goes over the SC freely deciding if the verification of each item apply or not to this case. In each of the three times of operation in which SC is verified, the player will interact with the other OR personnel responsible for the different questions raised by the SC. A series of traps, representing different possible situations that may occur, are presented to player including wrong recommendations encouraging the player to skip some verifications. The game randomly presents different sets of possible situations that makes the game more engaging and promotes repeated executions. At the end of every one of the three verification times, the game provides feedback to the player about its performance (i.e. items checked correctly). If the player omits an items, he/she is informed and will also receive feedback at the end of the game about their consequences (e.g. if the user did not check the patients name, a wrong patient may be operated on). The intended game-play lasts about 5 minutes to reproduce the real timing of the SC. But the two cases and the random traps included, promote replayability to improve retention and practice. 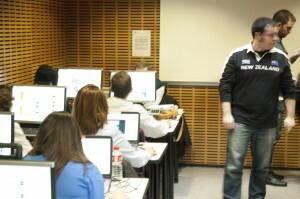 Currently, the game is being validated in Spanish hospitals for its content and applicability.